If you have any heart for the outdoors, spring will fill that heart with elation. Summer and fall, even winter, have their charms, but spring is the rebirth of hope. It is that time of year when the gates of ice and snow are opened and the long-imprisoned molecules of water are released into the world in a riot of babbling brooks, cresting creeks, and muddy roads. Two days ago, I opened our bedroom window and heard the faint hint of spring peepers on the wind. Yesterday, the lascivious call could be heard through the walls. For the next several months, these amorous amphibians will be guaranteeing fresh voices for next year. 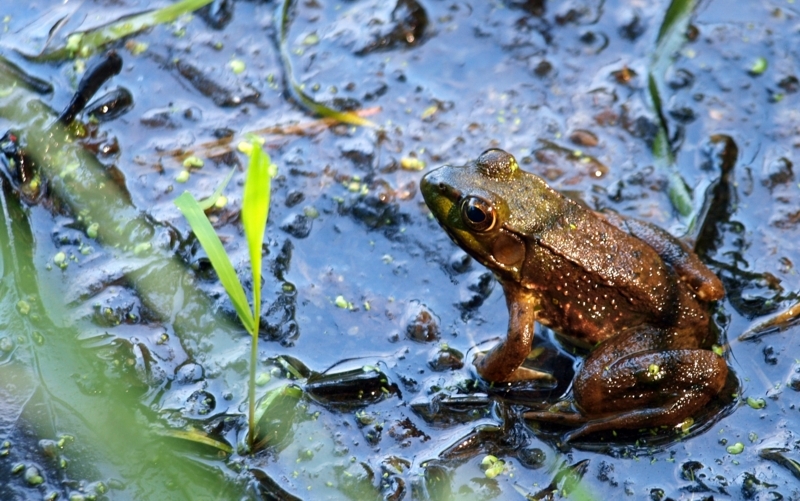 Spring peepers live about three years, so they fornicate like… frogs, I guess, in the short time they have. This week is spring break, and the timing couldn’t be more perfect. It’s the first week of the year where coats are not a necessity, and the kids can play outside without the twenty-minute ritual of snow pants, boots, hats, gloves, blah, blah, blah. Tater’s preschool teacher assigned some homework this week: Go outside and collect some nature. I love that. Hopefully you and yours are getting to do the same. We love telling you about a great book when we find one. Both of us writing on the site read quite a bit. What we never get around to sharing are the books we meant to read, or the ones we never quite finished even though they were quite good. To remedy this contrived shortcoming, I offer this list of the books that I wanted to read in 2013. First up, Henry David Thoreau. Earlier this year I started The Maine Woods. Those only familiar with Walden will find this an interesting departure. This book is not a social experiment, but a journal of his journeys into Maine. 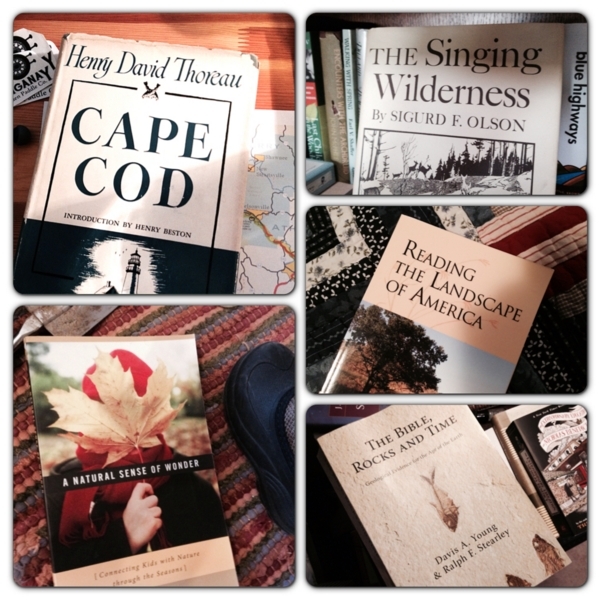 Cape Cod is a little different, as he is combining several trips to the Cape into one volume. Both of these are wonderful to read, and I look forward to getting past the first couple chapters. Have you heard of Sigurd F. Olson? If not, you need to read his stuff. This guy was a powerhouse in the environmental movement. The Singing Wilderness was his first book, published in 1956, and I feel somewhat ashamed to have not read this yet. Olson was especially known for establishing the Boundary Waters Canoe Area. I am still trying to track down a copy of his most well-known book, Reflections from the North Country. Talking with the president of a local land conservancy about some books I picked up, I mentioned this one. She grew very excited. Reading the Landscape of America by May Theilgaard Watts was the book she read in college that set her on the path to a career in conservation. I’ve heard similar stories from a handful of people, and now that I am a few chapters into it, I can see why. The book is brilliant. With a keen eye to the interconnectedness of various ecological landscapes, Watts describes an America that is in some ways no longer the one we would see today—even thought the book was written in 1975. For those of us in more conservative Christian communities, there’s a lot of misinformation circulating about evolution and the age of the earth. Two professors from Calvin College address the latter question in The Bible, Rocks, and Time. This book is a lesson in biblical hermeneutics, history of the geological study, and detailed scientific survey. I ripped right through the first two sections, but the last third of the book stopped me short. If I had some science background maybe I could have gone all the way (geologists will love it). In this book they tear apart the “5,000-year-old earth” theories posited by well-meaning young earth creationists. They begin with the Bible and respectfully offer a different reading of the scriptures that considers the texts in their historical and cultural contexts. They then go on to dispute the young-earth science. If you like this book, you will want to follow it up with The Lost World of Genesis One: Ancient Cosmology and the Origins Debate by John Walton. The final book I wanted to read was A Natural Sense of Wonder by Rick Van Noy. This is a book about one man’s journey spending time with his kids outside. What’s not to love about that! Of course, this list is limited by the audience of this site. Were I to list all the books I wanted to read this year, it would include Joseph Anton by Salman Rushdie, John James Audubon: The Making of an American by Richard Rhodes, and Shop Class as Soulcraft by Matthew Crawford (to name just three from the two-foot-high stack of books on my nightstand). John Muir was the founder of the Sierra Club. He died on Christmas Eve in 1914. He’d lobbied the government for what became Yosemite National Park. 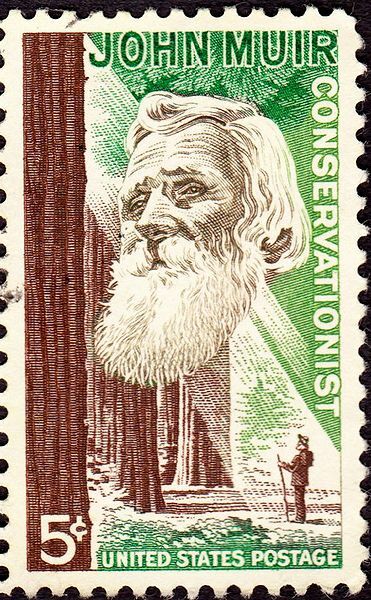 Thus, many call him the “father of the national parks.” When they made those statehood quarters awhile back, California’s featured John Muir. As such, and having been entertained lately by one of his books, I will present a short quote as often as I can to get his writing out to the very people he’d most like to reach, at least in my imagination of him. p. 68–69, My First Summer In The Sierra, John Muir. This week I’ve been reading a classic in the area of ecology writing, May Theilgaard Watts’ book, Reading the American Landscape. I was going to rave about the book and the way it so deftly elucidates the way native species have been pushed to the edges in North America. I was going to go on ad nauseum about how it’s a great tool for interpreting the natural and human history of a place. I like that about the book a lot. Some thought went into the book, but it’s not all heady. Lots of practical information too. 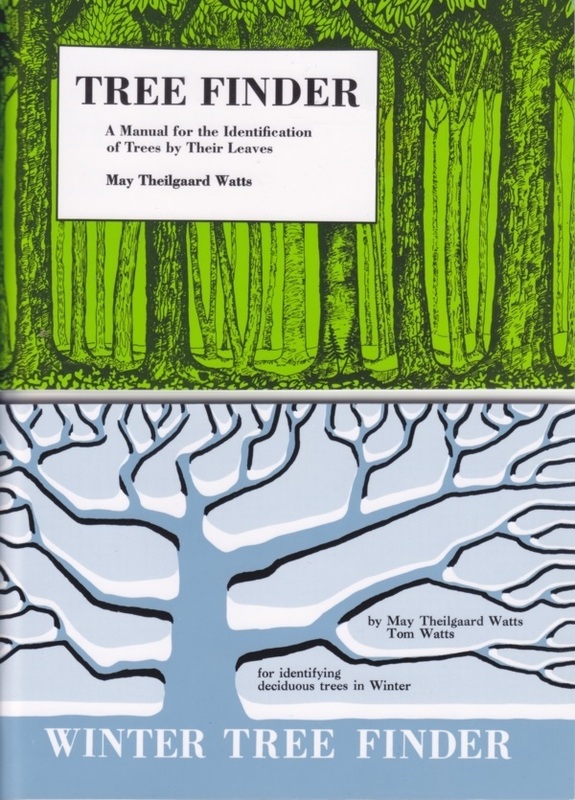 Then, just this afternoon, I realized that Theilgaard Watts was also the author of two of the handiest books you’ll ever find for identifying trees: Tree Finder and Winter Tree Finder! As anyone who has tried to id deciduous trees after they have all shed their leaves, the latter book is a God-send. A lot of my reading on nature topics seems to be motivated by a desire to not look like an idiot when I am out hiking. So far, it’s not been terribly successful, but there’s no shame in consulting a guide, and these two slim pocket-sized volumes are a lot more convenient than finding a chatty naturalist to follow you around. A 5-year-old may or may not summit every 4,000+-foot mountain in New Hampshire. Let that sink in a little. For perspective, if you live in or have visited New England, you may have climbed the popular Mt. Monadnock and felt the pain. Now realize that it is 3165 feet. Yeah. So “small” it was beneath her notice. By a thousand feet. In her mother’s book, Up, you can read all about it. About whether she made it, how she did or didn’t, and most important for some people, why did she even try? Alex Herr is the little (now a little bigger) girl’s name. 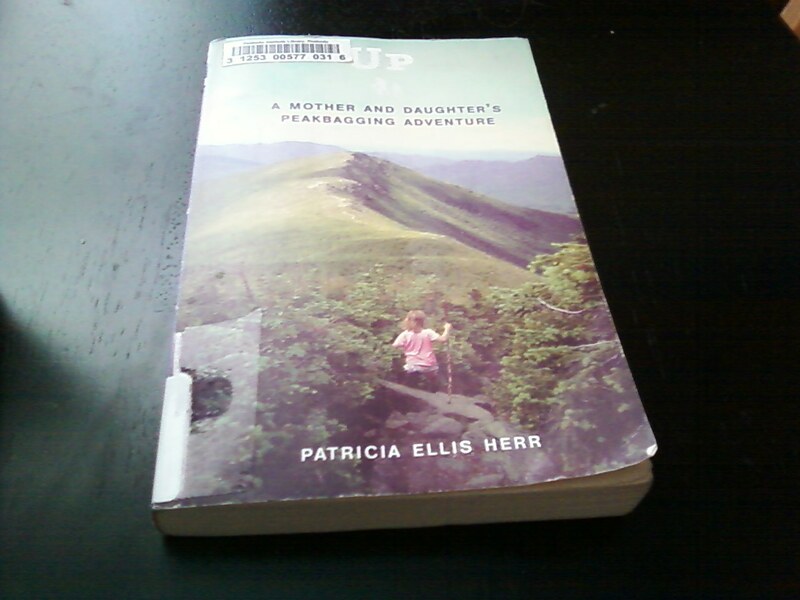 Her mother, hiking partner, and author of the book is Patricia Ellis Herr. Alex also has a sister who is quite the climber in her own right, and her name is Sage. You can follow their continuing and expanding adventures on their website. But for now, let’s focus back on our ODAJF mission. What can you and I as parents learn from the book? Obviously Alex (and Sage) are extraordinary little girls. My 7 year old girl won’t be standing atop the Presidential Range any time soon. But that’s not really what the book is about. I don’t think P.E. Herr expected to see her little girl standing there either, if I read the book right. Until Alex did just that. Girls wouldn’t do that on their own! But let’s unpack that rucksack a little. What precisely are these people saying? That kids can’t hike? Any parent knows they have 20 times the energy we adults have. That they can’t hike up a mountain because they’re girls? Muscle mass aside (which in no way comes into play for kids that young anyway, and if it did, wouldn’t smaller/lighter be an advantage, not vice-versa?) what does which private parts you have, have to do with your ability to walk an incline? That children have no motivation and wouldn’t climb a mountain unless threatened and cajoled? Granted, these are big mountains, but what could come more naturally than seeing a hill and climbing to the top? Isn’t this the simplicity and honesty we value in kids? Or maybe they were genuinely concerned. As I said, these are BIG hills. With real exposure and danger (a point Herr concedes in the very first chapter of the book). It’s been a few days since I finished the book so forgive me if I unwittingly paraphrase the author, but would these do-gooders prefer that Alex and Sage just sit on a nice soft couch and watch Disney Princesses and play video games, perhaps games portraying mountain climbing? (As if anyone would make that game). This is exactly what kids are so regularly criticized for! 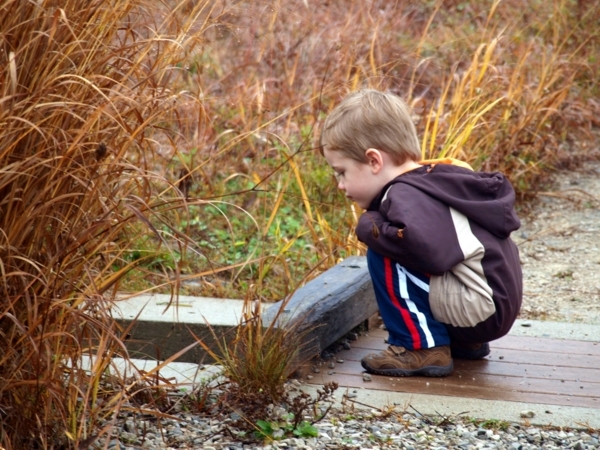 Is it better for children to face some cuts and scrapes, some discomfort, in order to experience the outdoors? When we come down to it, Alex’s climbing is the perfect metaphor. To those of us concerned with showing our kids the outdoors, how much “exposure” (danger) is too much? And frankly, how much is too little? How high has your daughter climbed in a tree? And how high do you remember climbing? I hope they’re roughly equal numbers, and when my daughter is climbing on rocks next to the ocean and I feel a little normal parental concern for her safety, I have to remember again the choice I continue to make. When I was riding her to school on a trail-a-bike during the cold part of fall, I had to ask myself each morning if it was worth it to “make” her do this? It’s only natural to want to keep our little charges safe and comfortable, but it’s up to you where to draw that line in the sand. How do you let them run a little free (climb mountains if they want to), while still being the parent/adult? Again and again, PEH discusses this in Up. Well worth reading when you’re trying to figure it out for your own child. You know the feeling. You show up at the beach, and it’s a nice day with a soft breeze, and… “Hey, Dad, what is this?” And sure, it’s a crab. But don’t you wish you could tell them more than that? I know I do. So I, the Monkey’s Aunt, and The M onkey’s Cousin have been spending some time at the beach. And perhaps you have too. And I thought I’d put together a quick bit of research so we can both have some answers to give our little darlings so we sound like the heroes we wish we really were. But first, a disclaimer for all you bio nerds out there. I do not claim for one second that this is very accurate. Let me make that clear. I will not knowingly steer you wrong, but I can’t claim any exact knowledge. This is about having something to say, not Beach Biology 101 at State U. That said, let’s talk crabs first. If it’s in a shell, it’s a Hermit Crab. “Is it a boy or a girl, Mama?” C’mon, do I have to tell you this? Pick one and go forward confidently. After that, things get more complex. But this isn’t all about lying or guessing. If it seems to be what you would traditionally consider a crab, there are three main possibilities. If it has sky blue legs and parts of it’s shell, it’s a Blue Crab. It’s pretty clear. If one claw is obviously bigger than the other, he’s a male Fiddler Crab. For all other crabs, you’re best declaring it a Rock Crab. Just tonight I was snorkeling at our local watering hole, and found one of those. If he seems particularly green, he may well be a Green Crab. 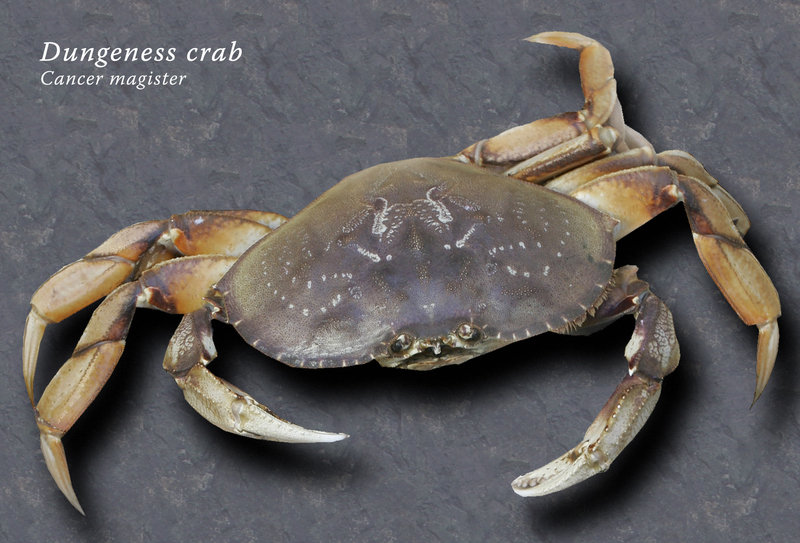 A Dungeness Crab, well, you’re on your own, but throw that out there if you’re feeling daring. Next, we come to birds. You know seagulls. But here’s something you may not know: If you see a brown one, that’s a kid seagull. A teenager. Not a female gull. If you see a smaller, faster, kinda psychotic little bird that has a black top on its head and bright orange beak, that’s a tern. There are lots of different kinds, but just say it’s an Arctic Tern. One of the farthest migrating birds of all. Goes clear from the North to South Pole. Why? Who knows. The little buggers with long legs are called Least Sandpipers. And they’re eating either sand fleas or worms. If you tell your kids there’s worms in the sand, you’re in for trouble. So tell them they’re eating bugs in the sand! At our beach, we also sometimes see swallows. If it moves at nearly the speed of sound, it’s evening, and you hear peeps—that’s a swallow and you should say thank you because they’re eating flying insects. And if you see a mostly brown bird that looks like it’s wearing a black collar, you’ve spotted the rare Plover. More probably, you’ll see signs warning you that they’re nesting nearby, and telling you to get lost. That just about covers it. Here’s one more tidbit though—when your kids find seaweed, which they will inevitably do, find the air-filled sacks, and point out how that helps the seaweed (you could call it Kelp if you like but that’s probably not what it is) float on the surface and photosynthesize. 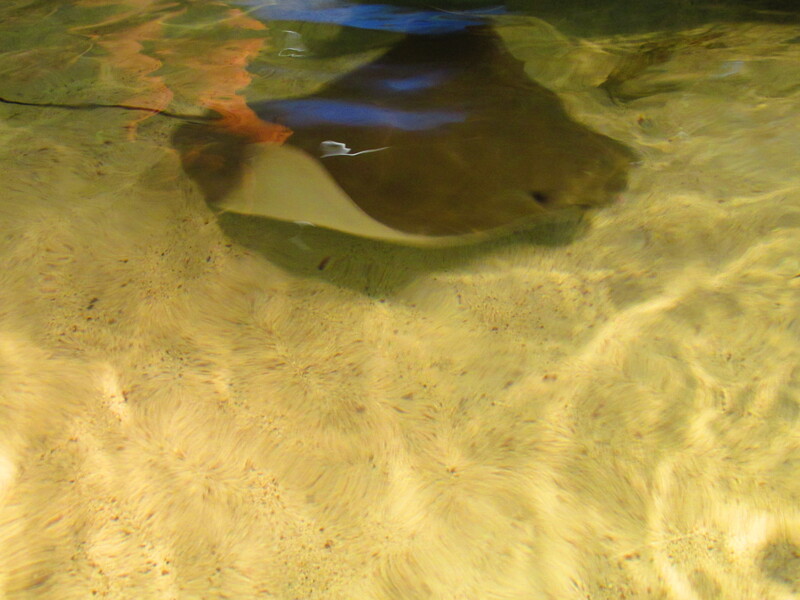 And one more thing: Those black rectangles with thin pointy ends are Stingray Egg Sacks. Hope that quick primer helps you out a bit. I’ve heard a lot of questions in preparation for it, I’ll tell you that. And remember, though they may not look like it at the time, your kids are building the foundation for a lifetime of nature appreciation here. If one hermit crab has to have a rough time so that your kid can grow up to value, appreciate, and conserve nature, it’s a small sacrifice that I think is worth making. Of course, you never want to stand idly by while your little monsters torture small animals, but within reason, it’s better for kids to touch, feel, and experience nature. In our house, that works out as: you can play with the hermit crabs, but don’t think you’re going to bring one home to certain death (we tried bringing some home and learned that lesson the hard way). The challenge: Burn a mess season’s worth of fallen tree limbs in a backyard that has been drenched by one of the coldest, wettest Aprils on record. Like most dads, I like to consider myself an expert at starting fires. Start off with easy-to-light tinder, add thin dry sticks and twigs. From there you build it up, starting with the smallest material first, finishing with the largest of your logs. Of course you will want to make room for air with either the log cabin or a pyramid shaped pile of wood. But even when you know what you’re doing, it’s not always easy to get a fire started, especially in the backyard after a month of rain and snow. The ground is wet; the wood is wet; and even the damp air seems against you. This was the situation last week when I headed outside to begin some spring yard work. Even with a paper grocery bag as tinder, I’ve gone through a half dozen matches before I can get a fire to catch. Either they get snuffed by a gust of wind, or smothered by the cold damp, or they light just fine, but then go out 30 seconds later. This time out, I was kind of excited to be testing a new product: the 5-Minute Cricket Firestarter. Originally from Sweden, these handy “matches” have recently been introduced to the American market. 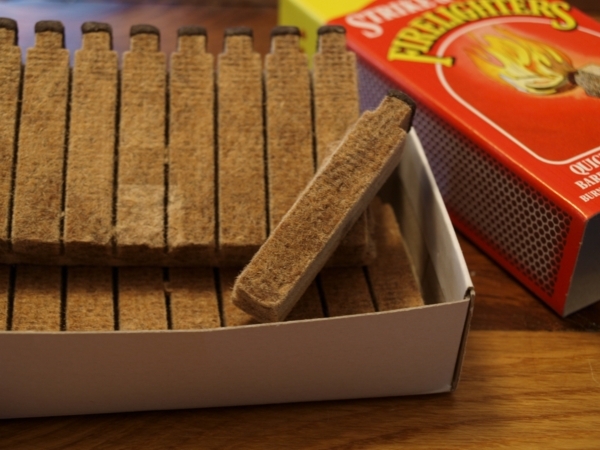 Like wooden matches, they come in a cardboard box with a strike strip along the side. Like matches, you pull one out and strike it on the box to light it. But that’s where the similarities end. The Cricket Firestarter is much thicker than a match, with a larger head, and once it’s burning it doesn’t stop for five minutes. It’s a match and tinder all in one. With crumpled paper for my base, I lit a Cricket and dropped it into a fold of the bag. With ordinary matches, this would have smothered the flame and I would have to light another. The Cricket just burned, and burned, and burned. 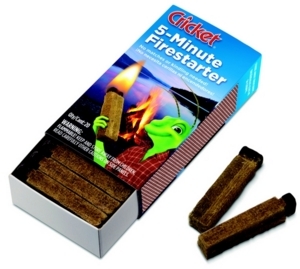 Frankly, I like the idea of involving kids in the whole outdoorsy-build-a-campfire project, but the best thing I like about these 5-Minute Cricket Firestarters is that they help me maintain my cred as the “expert firestarter.” I am pretty sure much of my dad rep will erode as the kids get older, but hopefully I can keep this bit going a little longer. My house is crazy with books. Right now I am trying to read a book on landscaping with native plants (specific to Michigan) as well as one for folks with tiny lots who want to homestead. There’s also What the Robin Knows, Hemingway’s A Moveable Feast, Bringing Nature Home: How You Can Sustain Wildlife with Native Plants, The Library at Night by Alberto Manguel, and Colonel Roosevelt by Edmund Morris—just to name a few from the stack next to my bed. Eventually this current reading obsession will wear off. I can already feel my bones aching for action. There are, of course, the usual chores to be attended to. The garage needs cleaning; I need to build shelves in the workroom, clad our roughed-in staircase, and finish the entry hall. The crawl space needs to be cleaned out, and a vapor barrier needs to be laid down. And this summer has me painting the house, landscaping and gardening, and tending to so much yard work I am almost overwhelmed already. I am also hoping to try my hand at hard cider. Bought some of the equipment last week, and now I am gearing up for a slow brew. 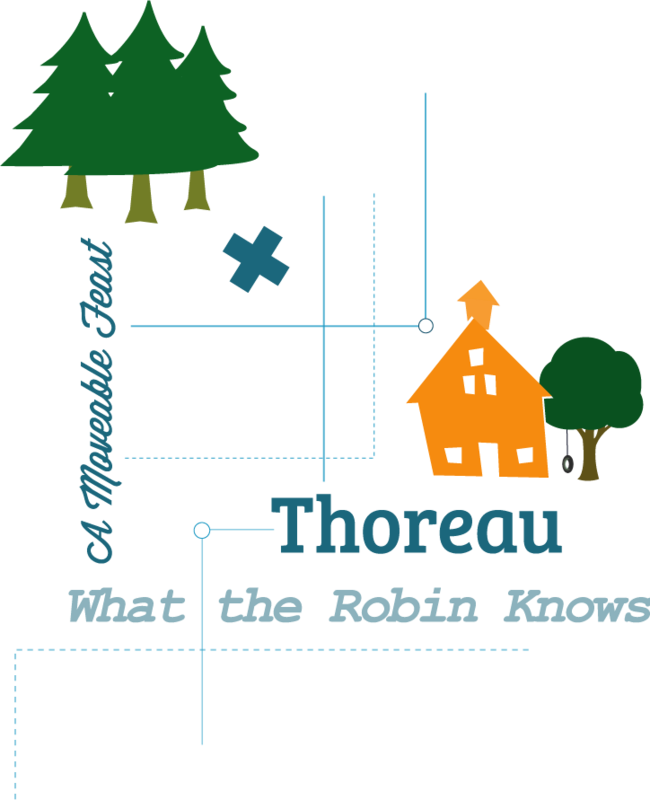 My dream project this summer would be to recreate Thoreau’s cabin as a workroom/seasonal office on our property. I’ve been researching plans online, and I think I can score materials relatively cheaply, but it’s likely a pipe dream on my part. And then there’s the writing, the most strenuous task of all. Writing projects are constantly on my mind. Back road guides to Michigan and Ohio are on the to-do list, but I also have a few more ambitious projects are also in the works. These later ones are more work and less sure, but a guy’s got to dream, right? All of this is part of an underlying desire to push back somewhat against the onslaught of modernity. (I don’t find it ironic at all that I am posting this on the Internet, since you asked.) Having read Neil Postman’s Building a Bridge to the 18th Century a few years back, I increasingly find myself trying to create a less technological atmosphere for our family. A big part of that is getting outside as much as possible, but it also means finding joy in simple cooking, reading books, and projects that keep the hands busy. So, what are you doing this winter? What are your plans for warmer weather? I’d love to hear what you’re reading and what the underlying philosophy is that guides your daily lives these days? I really love to cook and experiment in the kitchen. Because of that, I love checking out blogs of others who cook and experiment in the kitchen. Since it’s winter and there’s not much going on outside (wind chill near -20 here right now), I thought maybe you would like to see what I’ve been up to food-wise. 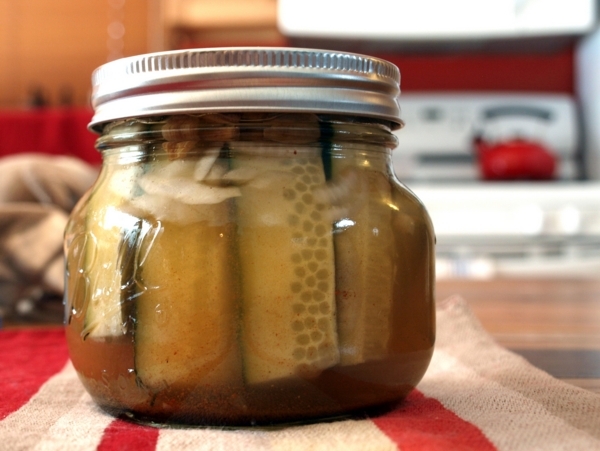 I love pickles, but the whole process of canning pickles has been an obstacle to really having fun with it. I mean, you have to pick up pickling cucumbers by the bushel when they’re in season. Then you have to clear off all your counter space and chop up onions and garlic and whatever else goes into your recipe. It takes a lot of time, and the window for pickling cukes is pretty small. All that is why I was so excited to hear about refrigerator pickles a few years back. Cut up some cucumbers (any kind you find in the store), add water and vinegar, some sugar and salt, and toss it all into a jar. The next day you got pickles. And if you want to try something unique, it’s no big deal. Just toss it into the mix. Yesterday I decided to go a little crazy and pulled all the Indian spices from my cabinet: garam masala, curry powder, cardamom pods. Instead of dill, I added a dash and a scoop of all these, plus a little cayenne pepper for some heat. The results are pretty good. I skipped the usual tablespoon or two of sugar and so they are a bit tarter than I was expecting, but the results are not at all unpleasant. The food angle is a new one on the site—a little beyond the picnic lunches and such that we’ve shared—so I would love your feedback. If you’re interested in hearing more from the kitchen, or want more specifics on the pickles, leave a comment below. I would love to hear from you. While a lot of folks look forward to this day after Thanksgiving, I am not that much into shopping for shopping’s sake (Go to Walmart at 5 a.m.? Isn’t that what the Internet’s for?). But November is a very full month for us. In addition to the usual full social calendar, school parties and activities, and church stuff, Grace’s birthday comes the week before Thanksgiving. So for us, the Thanksgiving weekend is three days of blessed rest. 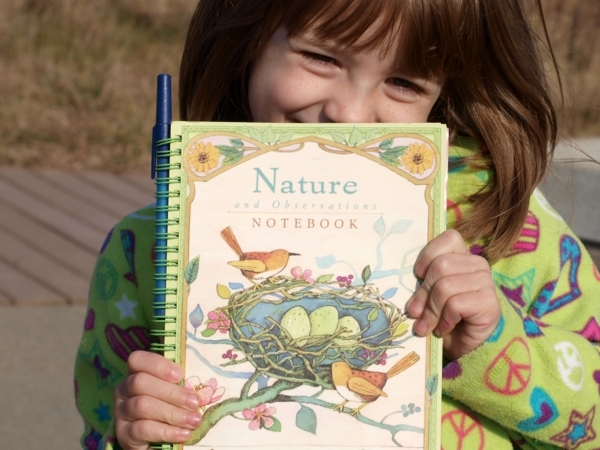 For her birthday this year, we bought Grace a nature journal (The Nature and Observations Notebook, to be specific). Perhaps a bit girly in design, the notebook comes with pages for note taking (aka “observations”), rooms for sketching, envelopes for collecting specimens, and stationary for sending notes to your grandma. I was under no illusions. The journal looks like a lot of fun, but kids are always missing the point of gifts—especially gifts we hope will deepen their understanding and lead to self-enrichment, etc. So I was actually surprised when Grace told us this was her favorite present. For two days she carried it with her wherever she went, even took it to bed at night. A couple days later she had her first day off from school and she demanded we go to the nature center. Happy to oblige this surprise turn in our gift-giving experience, I took her to the nature center. There she sketched cattails, a garter snake, and a gray tree frog. The woman at the counter even came around to take a look at Grace’s notes. 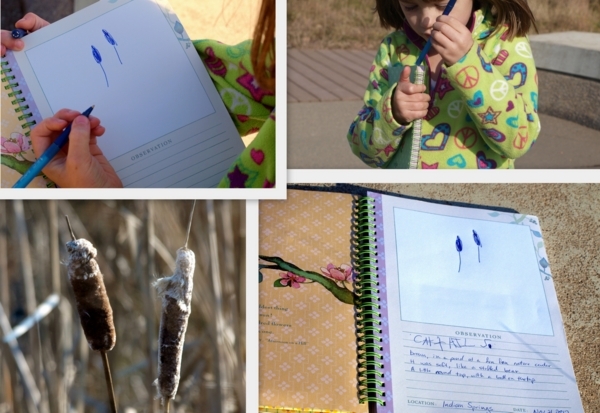 She practiced her spelling with CATTAILS and GARTER SNAKE, but I took dictation for the rest. I thought it would help her enjoy it a little more. Since then I’ve had to stop the car to pick pine needle specimens, and stoop for any number of leaves and acorn caps. So as the whole country looks toward buying this holiday season, I will be humbly reconsidering all my expectations and keeping an eye out for a few more gifts that will open my daughter to the outdoors. When Grace went back to school, Tater and I were at a loss. So much of his time is spent playing with his sister. Now that he was an “only child,” we had some retooling to do. This past summer I visited a lot of area parks doing research for a book. Many of them have nature centers, and I remembered all the time wishing my kids were with me. Our first trek took us to the Indian Springs Metropark. The swampy sections of the park are the headwaters for the Huron River, which gains much in the way of volume and dignity between here and Lake Erie. The Environmental Discovery Center, as it’s called, overlooks a small pond. Most of our time was spent outside, looking for snakes and frogs along the shore. Since this is classic massasauga rattler habitat, I was glad it was a cold day. A small brook connects the main pond with a smaller adjacent pond. Much time was spent watching the water flowing between the two. 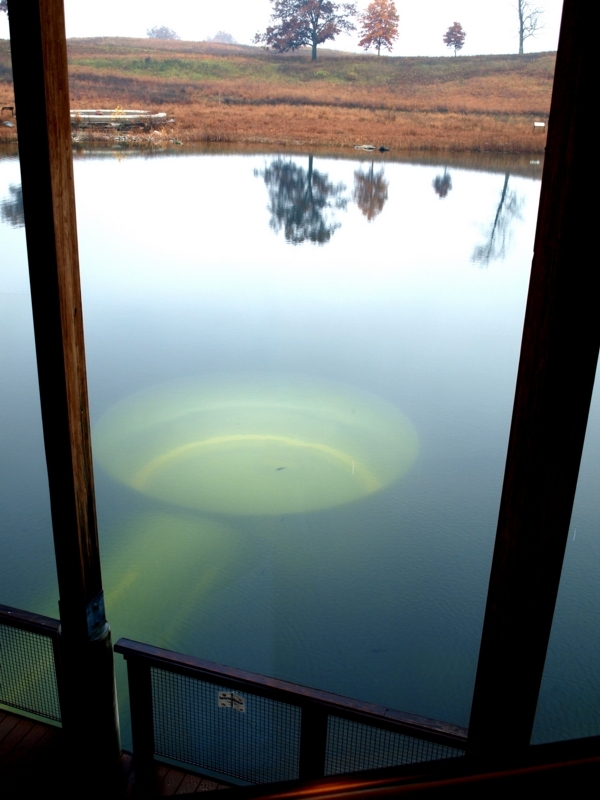 One of the big attractions at Indian Springs (one surprisingly few people know about) is the Pond Room. The lower level (i.e. basement) of the nature center is below the level of the pond—roughly the same level as the pond floor. A clear tunnel leads out from the main building under the water to a circular domed room. From here you can watch fish swim by and get a close look at the habitat created by logs that have fallen to the bottom. The Pond Room is my favorite part of the site, but, frankly, it kind of freaked Tater out. Confined underwater spaces, apparently, aren’t his thing. So after the Pond Room we went upstairs and looked at some of the animals on exhibit—a garter snake, salamander, turtles. All in all a good visit, and Tater now tells his sister that the nature center is “his and daddy’s place,” which is kind of nice too. Next week we’ll look for someone showing off animals. I think the boy is itching to hold a snake.